Brace yourselves, summer is here! We know how to take care of our skin by using sunblock. But what about our eyes? UV rays can be detrimental to your eye health. Prolonged exposure can cause blurred vision which can be associated with cataracts and macular degeneration. 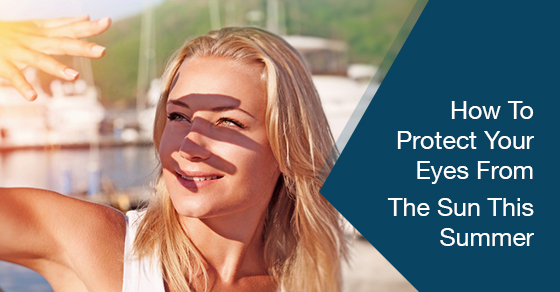 The best way to avoid eye problems is avoiding prolonged exposure to sunlight. So take breaks! Look for shade either indoors or under an umbrella so your eyes can rest for a bit. Studies show those who spend long periods of time in the sun develop cataracts at an earlier age. The Environmental Protection Agency states that sunglasses should have 100 percent UVA and UVB protection. Sunglasses can also protect you from developing photokeratitis, photo conjunctivitis, cataracts, and pterygium. Whether you’re in the pool or the lake, it is imperative that you wear goggles. Pools are diluted with chlorine that can irritate your eyes; lake water has contaminants, but wearing goggles will help prevent infection. We are what we eat. Eating right makes our body stronger, and it can lower your risk of eye disease. Foods rich in lutein and zeaxanthin help prevent macular degeneration and cataracts. In addition to these two antioxidants, Vitamin C, Vitamin E, and Zinc can help treat macular degeneration. More importantly during summer, we become dehydrated easily. Drinking plenty of water helps replenish fluids in our body including our eyes. Following these three tips will ensure that you have a happy and healthy summer!